mid 19th century: from the name of Samuel Augustus Maverick (1803-1870), Signer of the Texas Declaration of Independence. A Texas lawyer, engineer and rancher who did not brand his cattle. In March of 1836, a small group of brave “Texian rebels” holed up in a small Spanish mission, known as the Alamo. Facing certain death, these brave men took a stand against oppression. Among those Sam Maverick was elected to represent San Antonio de Bexar in the new Republic of Texas. Maverick rode under cover of darkness with a message for help to Washington-on-the-Brazos. The remaining defenders of the Alamo were killed a few days later. In 1839, he was elected to his first term as mayor of San Antonio and during this time he also served as city treasurer and precinct justice of the peace. He was a member of the San Antonio militia, protecting the city from Comanche attacks. Sam participated in the Council House Fight on March 19, 1840. By the end of 1840, Maverick owned almost 5,000 acres with almost 13,000 acres under survey. In 1844, the land total included over 35,000 acres by title and an additional 20,000 by survey. The following year he purchased an additional 11,000 acres on behalf of his father. He was officially a Texas land baron. Sam continued to purchase land across Texas. But home was San Antonio and the land where Maverick Whiskey now stands was on the original family property. Records indicate that what is now Maverick Whiskey, proudly stands where the corner of the family homestead was once plotted. After Texas was annexed, Maverick served in the Texas legislature. Years later, he supported Sam Houston in his rally to support the Union during the American Civil War. However, he voted for succession as a member of the convention. He served a second tour of duty as mayor of San Antonio after the Civil War and helped reorganize the Democratic party. His mark on the city of San Antonio is profound, wide spread and still felt today. The bell at St. Mark’s church was made by Maverick from a cannon taken from the Alamo. Through out Maverick’s remarkable life he cheated death many times. From Malaria upon his arrival in Texas, prompting him upon recovery to move to the drier climate of San Antonio, his time in combat at the Alamo, an illness forcing him to recuperate in Nacogdoches after signing the constitution, being captured by the Mexican Army and then released, narrowly escaping a comanche raid on a surveying trip in 1839, and almost drowning when his boat capsized in 1845 – Maverick lived life to the fullest, if only we could all #livelikesam. When did sam first own land? A fter Sam Maverick signed the Texas Declaration of Independence and fought in the Battle of San Jacinto, he returned to Alabama to tend to family business. During his journey the always gentlemanly Sam came to the aid of a young woman who had dropped her handkerchief from atop her horse. Cupid’s arrow had struck. The owner of the dropped delicate was Mary Adams, his future wife. 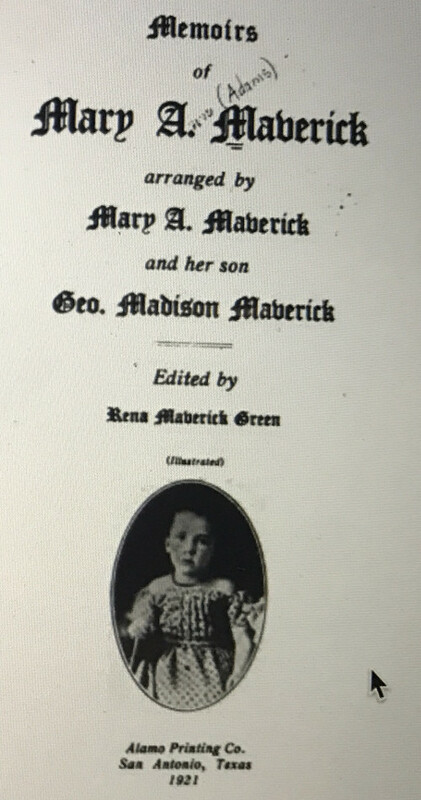 So, on October 14, 1837, the young couple and their newborn son, Sam Maverick Jr, set off from the Maverick family plantation in South Carolina bound for Texas. The party reached Texas soil on New Year’s Day, 1838. Their journey up to this point had been without “serious trouble or accident” according to Mary. Once on Texas soil, the family braved “swamp prairies”, fierce winter storms, and vast areas of unsettled land which tested their provisions. They even experienced a lively encounter with a group of Indians; but undeterred, the Mavericks finally settled in San Antonio in June of 1838. Texas was still an unstable land and threats from Indians and Mexican troops always lingered. The family lived as refugees for several years and at one point Sam was even captured by the Mexican Army. He was frequently away on business and Mary was left alone to manage family affairs and the growing family. The family’s physical safety were not Mary’s only worries. Illness struck the family often and four of her ten children died before reaching their eighth birthdays. The children’s death deeply impacted Mary and she became very involved in the Episcopal Church, helping to found St. Mark’s; a parish which is still active today. Together, the Maverick’s served as prominent citizens of San Antonio shaping city government, commerce and the town’s traditions. Mary was deeply involved in the Battle of Flowers that was the precursor to the modern day celebration Fiesta. 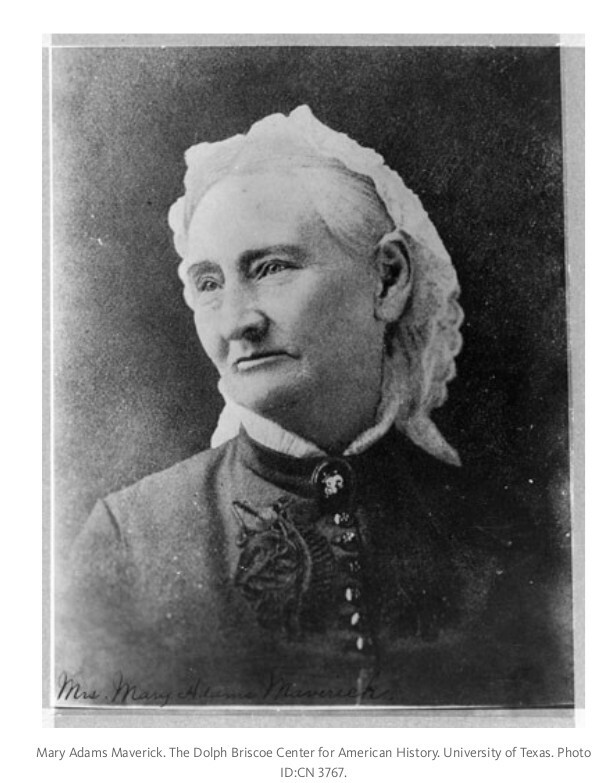 She helped save the Alamo from development and was an active member of the San Antonio Historical Society and the Daughters of the Republic of Texas. When Sam died, Mary found her old handkerchief among his most treasured possessions. A true Texas gentleman, he never forgot the moment he met the love of his life. 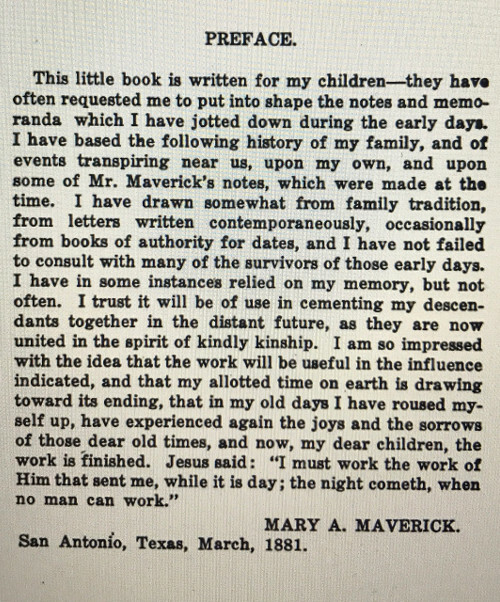 Mary Maverick dedicated her life to Sam and their family as well as to honoring Texas history. She lived to be just a few weeks shy of 80 years old, a remarkable feat for a woman who faced so many challenges and gave so much to the state her husband loved. Was Mary really the first anglo woman to live in San Antonio? How do you know all this great stuff about Mary? Was Mary a normal stay at home mom? So she's basically San Antonio's mom? Mary surrounded by five of her children. 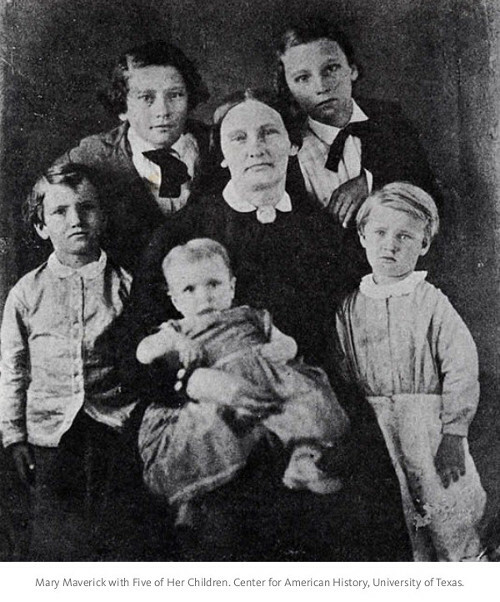 Four of her sons went on to serve in the Confederate Army. All adored their mother. 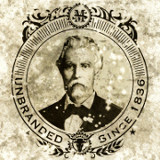 Join our mailing list to receive the latest Sam Maverick Spirits news, updates, and whiskey tips!